Air Force Chief of Staff Gen. David Goldfein gives his first "Air Force Update," during Air Force Association's Air, Space Cyber Conference, in National Harbor, Md., Sept. 20, 2016. 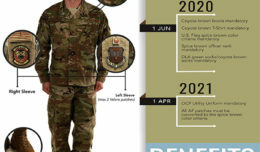 The 21st chief announced his three focus areas: to revitalize the squadrons, strengthen joint leaders and teams, and improve multi-domain, multi-functional and coalition-friendly command and control. Air Force Chief of Staff Gen. Dave Goldfein outlined his top three focus areas — revitalizing squadrons, strengthening joint leaders and teams, and advancing command and control — during his Air Force Update address at the Air Force Association Air, Space and Cyber Conference in National Harbor, Md., Sept. 20. “I’m passionate about the business of joint warfighting and the air component’s contribution to the joint fight and the joint team,” Goldfein said. Goldfein’s experiences throughout his career have led him to believe the three elements of the strategic vision are foundational. “If we focus on the (strategic vision elements) over the next four years, it will actually set us up to be able to do the work we need to do as the air component for the joint team and the nation,” Goldfein said. During his remarks, the general also named the three Air Force leaders who will champion his focus areas. Brig. Gen. Stephen L. Davis will re-evaluate the makeup of the Air Force’s fundamental unit, the squadron, and determine what a 21st-century squadron needs to look like, Goldfein said. Squadrons operated very differently during Vietnam, however the structure hasn’t changed over the last 50 years even with a demand signal that has increased exponentially. According to Goldfein, leveraging the total force may be one way squadrons could see change. Brig. 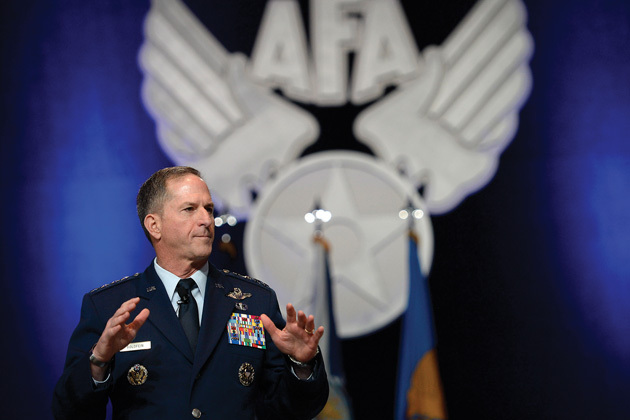 Gen. Brian M. Killough will improve how the Air Force develops joint leaders and how it teams with other services for the future, Goldfein said. For years, the military has focused on violent extremism, he said. However, the world began to change in 2014, when countries like China, Russia, Iran and North Korea became more active while the military continued to face the threat of violent extremism. Because the Air Force develops Airmen as technical experts first, there is a small window to develop them for the joint fight. 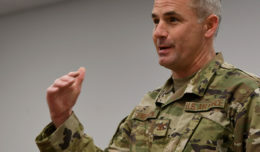 Goldfein said that while he was on the joint staff he saw how each component approached and attacked the problem from their unique domain whether it be land, sea or air. He also wants to review the way the Air Force sends individual Airmen downrange. While Goldfein understands Airmen will not always deploy as a squadron, he wants Airmen to train, equip, deploy and re-deploy as a team. Brig. Gen. B. Chance Saltzman will lead the charge advancing multi-domain, multi-component command and control capabilities so the service is more networked and can make decisions rapidly. 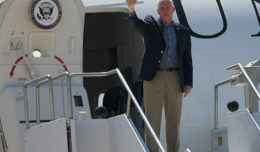 “I truly believe that we, as an Air Force, not only get this, but we can be the connective tissue for the joint force as we go forward and move into the information age of warfare,” Goldfein said. Goldfein said the Air Force needs industry partners to work together because it starts with fundamentally changing the way the Air Force thinks about procurement. The Air Force uses a multitude of sensors across many domains and Goldfein sees an age where common mission systems, data, architecture and artificial intelligent systems fuse the information in a way that provides us decision quality information faster than our opponents, changing the way the future of combined arms operate.